so why not a snicker doodle cupcake? 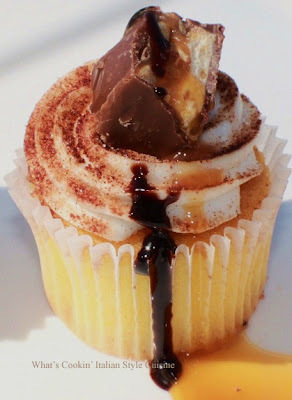 Simple ingredients to make a delicious moist cupcake sure to get you many compliments. These were a huge hit... here's the recipes. Preheat oven on 350 degrees and line a pan for at least 12 cupcakes. In a large mixer bowl whip the sugar and butter till light. Add the eggs and beat into the mixture. Add the dry ingredients alternating with milk and vanilla. Spoon into cupcakes tins filling almost to the top leaving around 1/4 inch space. Bake at 350 until the middle springs back around 25 minutes or until the toothpick is clean in the centers. Cool completely. In a large heavy duty mixer whip the buter and sugar adding around 2 tablespoons of heavy cream, together until light around 8 minutes. Add the cinnamon and vanilla when this is completed and beat in. 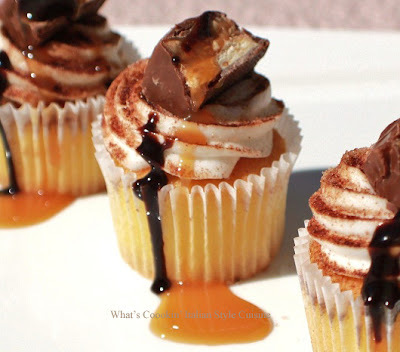 Spread on cooled cupcakes and garnish with cinnamon sugar mixture, snickers bars and drizzle with both chocolate and caramel ice cream toppings. You have found my candy weakness, Snickers. These look fantastic and with cinnamon and caramel you can't go wrong. Yumm. OMG - these look AMAZING! !